Livestock were integral to the area's economy, but as the mountain pastures have been taken over or polluted by mining activity, herding has been severely affected. Many narrators talk of the decline in numbers, partly because of reduced access to good grazing land, and partly because the mineral waste has seeped into the mountain streams and water supplies and poisoned animals. While controls on pollution have improved somewhat, the livestock industry will struggle to recover: some pastures are so contaminated that they will be of no use for years, if ever. Meanwhile, the demand for wool products, for example, has changed. Synthetic dyes and textiles are popular now, lament several older campesinos, who remember a time when the communities' meat, wool and weavings attracted buyers from far afield. One man says: "Before we used to use our wool, sheep wool, alpaca wool, llama wool, for jumpers, and now we don't any more. Now it's all plastic and foreign dyes. Before I used to know the natural dyes, from plants, which were hard to fade. Now everything's plastic and the dyes all synthetic, synthetic wool [too].there's no real wool now. Very occasionally they still use lambs wool but quite frankly it's looked down on these days" (Peru 8). Some farmers have moved higher up the mountain to escape the effects of the mining industry, and are trying to concentrate on those breeds best suited to the harsher conditions. But many farmers say they need more support and training to develop the livestock industry, a requirement which it seems is largely unmet: ".basically the government, especially the Ministry of Agriculture, hasn't given us any concrete training in the way we should rear livestock, or how we should improve the livestock. On the higher ground we have livestock, a small amount, a few sheep and things, but there's no way of bringing back this way of life for the campesinos" (Peru 8). It seems the experts can't help with the pollution-related illnesses and traditional remedies are also of limited use: "The vets who come, the agriculturists, can't give anything for this illness. They cure other types of illness of course, other things, but they don't have anything for the illness [they get] from the fumes, it's difficult for these vets to cure" (Peru 9). There is great sadness in the stories about the decline of herding and the illnesses that have afflicted livestock. The herders' relationship with their animals was more than just pragmatic. The "animals' feast" is still a key event in the rural calendar and the mountain pastures at the time are dotted with animals wearing brightly coloured ribbons. "The animals' feast is celebrated with Carnival in February and March.We take [an] offering to the mountain, the patron of the animals, because the mountain looks after the animals and all livestock-owners have absolute faith in him..." (Peru 30). ".these days you can't have sheep, it's better to have camelids because the pastures are now pure rubbish. Camelids can feed from scrub land and they need less care. They're more hardy and also the medicine is cheaper, so... yes, cattle, sheep and goats are all very weak compared to the camelid which can survive [anything]. We generally use the name 'camelid' for llamas, mainly llamas, alpacas as well.but alpacas are weaker than llamas. On one occasion we did buy them, thinking of the wool; we bought 10 but they didn't even last a year. everything that had been invested was lost.We wanted to rear alpaca for the wool, because that's where the money is, but it's not possible on this land, with the pollution and everything." "The smoke turfed us out. It fell like snow [and] ruined the land, the rock, the pasture and the livestock. It was a complete disaster, no harvest and the animals dying off in droves.... it was like they were poisoned by the arsenic dust from the foundry. That's why we went off to different places, like nomads we were, we took our little animals to see where we could rent grazing land." "Before, business was much more comfortable in every way. More pig meat, animal meat, milk. We had everything because we had enough animals. Recently, we've become poor because of the fumes from La Oroya." "We only possess a small amount of livestock [now], because of the fumes, which cause an illness which kills through paralysis.it makes them act as if they're drunk, and after a short while, they die. To prevent this we need a cure, but these days medicine costs so much, too much, and you can't survive. No comunero, for example, has any more than 100 sheep these days, when before they used to have 500, 600 or 900. the livestock situation is very sad and the poverty is great." "Economically [Rancas] has mainly [depended on] livestock ... animals from the South American camelid family, better known as llamas, alpacas and huanacos which are similar smaller animals. 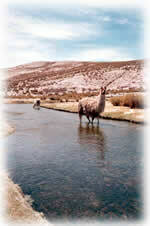 There have also been wild vicuñas and then recently we've raised cattle. But the environment and climate isn't suitable for pure-bred cattle, just the ordinary cattle. at an altitude of 4,000 to 4,350 metres above sea level it's icy cold." "We have many feasts in Rancas. One of the most important is the animal's feast, the rural feast, which we call Erranza.in February and March which coincides with Carnival. The Erranza feast is celebrated by each family on their farm and by each man and woman who has worked with the animals, the paspotes, throughout the year. These people rarely go to town and sometimes they can't even go to school...But, those of us who live in Cerro de Pasco go back in a group to celebrate this feast as it should be, with the whole family and we become part of that once again."